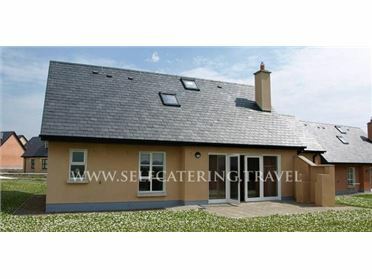 The Stable Lodge is a detached cottage located near the village of Macroom in County Cork. Hosting one bedroom, home to a double and bunk bed, along with a wet room and cloakroom, this property can sleep up to four people. Inside, you will also find an open plan sitting, kitchen and dining area. To the outside, is off road parking for two cars, a shared games room and a shared garden with furniture. Situated in a peaceful location and close to local attractions, The Stable Lodge is a delightful cottage in a lovely part of Ireland. Carrigadrohid is a village in County Cork home to a shop and pub and also to Carrigadrohid Castle. Nearby is the small market town of Macroom with a choice of shops, restaurants and pubs, three hotels and a weekly street market. Three miles away lie western Europe's only extensive remains of Alluvial Forest. The cities of Cork and Killarney are within easy distance, as are the beaches of West Cork. Oil central heating. Electric oven and hob, microwave, fridge. TV with Saorview, radio, selection of books, games and DVDs. Fuel and power inc. in rent. Bed linen and towels inc. in rent. Travel cot and highchair. Off road parking for 2 cars. Shared garden with furniture. Shared use of games room with snooker table and bar at owner?s B&B, just 4 mins walk. Sorry, no pets and no smoking. Shop and pub 2.7 miles. Note: Free WiFi is available at the owner's B and B..